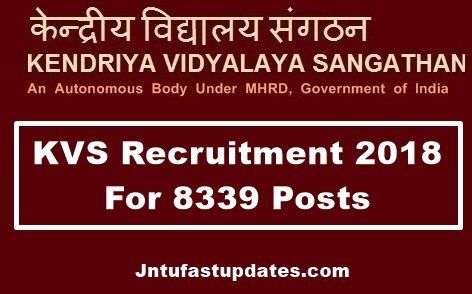 KVS Recruitment 2018: Kendriya Vidyalaya Sangathan (KVS) has released recruitment notification for the vacancy of 8339 teaching jobs. The issued notice is for recruitment of Principal, TGT, PGT, PRT, Librarain and Vice-Principal posts. Direct Recruitment of Principals, Vice-Principals, PGTs, TGTs, Librarian and PRTs in KVS: Kendriya Vidyalaya Sangathan (KVS), henceforth referred to as KVS, an Autonomous Organization under the Ministry of Human Resource Development, Government of India invites online applications from Indian Citizens for filling up the vacancies of Principal, Vice Principal, PGTs, TGTs, Librarian and PRTs in Kendriya Vidyalayas. The number of vacancies is tentative in nature. For detailed information regarding eligibility criteria, age relaxation, examination cities, fee, choice of zone, important instructions, scheme of examination, mode of selection etc. candidates can visit KVS website www.kvsanpathan.nic.in at home page i.e. Announcement and Employment Notice sub-head vacancy position.